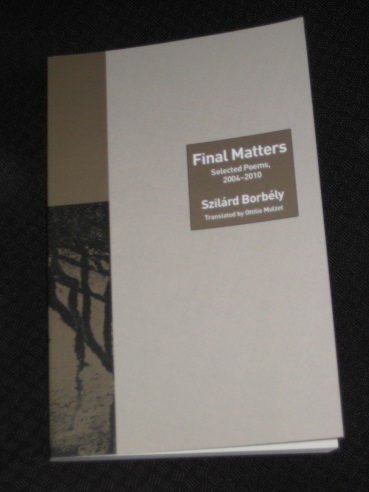 Szilárd Borbély’s Final Matters: Selected Poems 2004-2010 (chosen and translated by Ottilie Mulzet, review copy courtesy of Princeton University Press) actually contains a number of poems from two different books, Final Matters, Sequences, and Borbély’s final work, To the Body: Odes and Legends. As Mulzet explains in her illuminating afterword, the translations were made without slavishly following the original Hungarian rhyming conventions in an attempt to produce English versions devoid of the stiffness that can arise in over-literal renderings. The final versions are certainly beautifully done, and for those who (unlike me) can appreciate the originals, the Hungarian text faces the translation, allowing for easy comparison. To the Body is a volume consisting of a number of lengthy poems, confessional pieces that almost cross over into short-story territory at times. There are two main themes that emerge, with one being women and childbirth, a topic explored from many different angles. Mulzet explains how despite being the poet’s last published collection, To the Body saw Borbély, even at this late stage, pushing his boundaries with a new style, adapting real stories and attempting to share the experiences of the women whose tales he tells. Abortions aren’t the only topic, though, with other speakers discussing repeated miscarriages, post-natal deaths and eventual successes in raising a child through those first few dangerous months of life. It’s all rather powerful and moving. Most of the book, though, is devoted to Final Matters, and the afterword has Mulzet soberly informing us of the history behind the book. As it turns out, it’s a form of catharsis, gradually developing from the writer’s reaction to the brutal murder of his parents. The work is divided into three parts, three sets of sequences, with each having a separate title and its own feel, exploring rather different themes. of the crackling, reusable fat. No, it doesn’t always make for pleasant reading, but it’s obviously not meant to be. This brutal touch runs through the section, with many a hint of the darker side of the Christian story. of the soul, an imperceptible fissure lingers. In her afterword, Mulzet does an excellent job of explaining the many themes covered, and it certainly helped inform my reading of the collection. I’d be the first to admit that certain aspects of this background, particularly the religious aspects, fluttered prettily over my head without leaving an impression, but other readers will get far more from her wise words. There are many great Hungarian writers with work available in English now, and Borbély is another name to add to that list, a writer whose poems often had me coming back for a second (or third) glance. Of course, prose is still my preference, but a little poetry now and then can’t hurt, and this was a book I enjoyed. I hope other readers will agree.